WHY WE TEST CONCRETE STRENGTH AFTER 28 DAYS? Why do we test concrete compressive strength after 28 days? The table below shows the compressive strength gained by concrete after 1, 3, 7, 14 and 28 days with respect to the grade of concrete we use. From above table, we see that, concrete gains 16 percent strength in one day, 40 percent in 3 days, 65% in 7 days, 90% in 14 days and 99% strength in 28 days. Thus, it is clear that concrete gains its strength rapidly in the initial days after casting, i.e. 90% in only 14 days. When, its strength have reached 99% in 28 days, still concrete continues to gain strength after that period, but that rate of gain in compressive strength is very less compared to that in 28 days. After 14 days of casting concrete, concrete gains only 9% in next 14 days. So, rate of gain of strength decreases. We have no clear idea upto when the concrete gains the strength, 1 year or 2 year, but it is assumed that concrete may gain its final strength after 1 year. 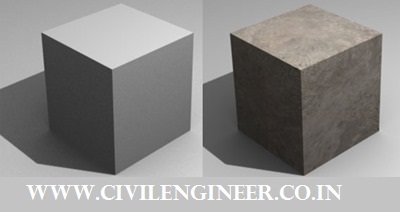 So, since the concrete strength is 99% at 28 days, its almost close to its final strength, thus we rely upon the results of compressive strength test after 28 days and use this strength as the base for our design and evaluation. Though there are also some rapid method of testing concrete compressive strength which gives relation between rapid test methods and 28 day strength. This rapid test is done where time is limited for construction and strength of structural member must be known to carry out further construction work.